Dr. James Boynton, a plastic surgeon in Houston, will be hosting an aesthetic event at his practice on December 1 from 5:30 p.m. to 7:30 p.m. to increase awareness about the latest cosmetic enhancement options available in plastic surgery. The event will include special pricing on aesthetic treatments, a complimentary consultation with Dr. Boynton and his staff, raffles, and refreshments. Dr. Boynton says he hopes the event will create more excitement about the advancements in plastic surgery and aesthetic enhancement treatments such as BOTOX® Cosmetic and breast augmentation in Houston. 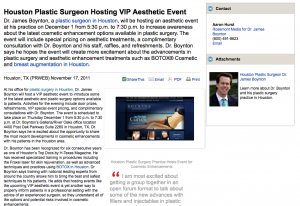 At his office for plastic surgery in Houston, Dr. James Boynton will host a VIP aesthetic event to introduce some of the latest aesthetic and plastic surgery options available to patients. Activities for the evening include door prizes, refreshments, VIP special event pricing, and complimentary consultations with Dr. Boynton. The event is scheduled to take place on Thursday December 1 from 5:30 p.m. to 7:30 p.m. at Dr. Boynton’s Galleria/River Oaks office location 4400 Post Oak Parkway Suite 2260 in Houston, TX. Dr. Boynton says he is excited about the opportunity to share the most recent developments in cosmetic enhancements with his patients in the Houston area. Dr. Boynton has been recognized for six consecutive years as one of Houston’s Top Docs by H-Texas Magazine. He has received specialized training in procedures including the Fraxel laser for skin rejuvenation, as well as advanced techniques and practices using BOTOX in Houston. Dr. Boynton says training with national leading experts from around the country allows him to bring the best and safest techniques to his patients. He adds that hosting events like the upcoming VIP aesthetic event is yet another way to properly inform patients in a professional setting with the advice of an experienced surgeon, so they understand all of the options and potential risks involved in cosmetic enhancements. About James F. Boynton, M.D., F.A.C.S. Dr. James Boynton received his undergraduate degree from Duke University and his Doctor of Medicine from the University of Texas Medical School at Houston. He completed his plastic surgery residency at St. Joseph Medical Center and his general surgery training in Phoenix, AZ at Good Samaritan Regional Medical Center in Phoenix, AZ. In addition, Dr. Boynton completed fellowships in hand surgery at Baylor College of Medicine and a Microsurgery Research Fellowship at CHRISTUS St. Joseph Hospital. He is a Diplomate of the American Board of Plastic Surgery and a member of the American Society of Plastic Surgeons, the American Society for Aesthetic Plastic Surgery, the American College of Surgeons, Texas Society of Plastic Surgeons, and the Houston Society of Plastic Surgeons. Dr. Boynton has also been involved in several international mission trips in Guatemala, Bolivia, and Peru performing cleft lip and palate repairs. With two locations at 12727 Kimberley Suite 300 in Houston, TX and 4400 Post Oak Parkway Suite 2260 in Houston, TX, Dr. Boynton’s practice can be reached at (713) 354-5119. It can also be contacted online via the website facebook.com/DrBoynton.